I came across a very interesting piece in Talent Magazine that included tips on how to be wildly successful in the workplace. Interestingly, it describes workers in terms of three categories: Takers, Matchers and Givers. These three personality traits describe the characteristics needed to succeed in the workplace. The three trends that shape our relationships and personal reputations are the following: project-based work, the knowledge or service economy and the rise of online social networks. All of these elements combine together for a more interconnected workplace and one in which we must put the team first. This may not be a surprise to most employees, but the achievement of long-term success can now be attributed towards our attitude of working on groups and how we act as either a Taker, Matcher or a Giver? How do you measure yourself in terms of servant leadership? This definitely relates to my work (retail). I have co-workers that all are all for the team work, and than I have some co-workers that are deemed the “takers”, which are the ones that leave their unfinished tasks/products for those who are the “givers”. and “matchers”. After awhile, the givers in my work place, stopped giving or matching with helping with projects and tasks because that one “taker” took advantage of it. The “taker”, definitely puts a hitch in flow and productivity in, but with so many more “matchers” and “givers”, it manages to work out in the work place. How does one help steer a “taker” to become a “matcher/giver”? I definitely think this point of view is interesting. It is really true in life, there are “takers, givers, and matchers”. I think that these personalities come out in every aspect of life: personal relationships, group work, school, professional life. Personally, I think it is most important to have a balance. Sometimes you have to be more of a “taker”, in order to learn and improve your skills. However, other times you need to be more of a “giver” to help others in the work place/school/personal life. And other times its best to be a “matcher”, in order to improve a group’s dynamic. Thus, I think it depends on the situation as to what role you choose to play. Personally, I think I have played all three roles at different times both academically and professionally. Balance is key here! I think the best thing to do with “takers” is to lay out some ground rules. Especially when you’re in a team, it’s good to get everyone on the same page. Ideally it would be nice to be in a group of “givers” but the reality is that a team will probably consist of some “takers” and “matchers” as well. I think by being really clear about the expectation and rules upfront and having everyone agree to them, you can at least encourage everyone to be a “matcher.” It seems to me that being a “giver” is either a quality you are born with or something you’ve maybe learned through life experience, but it probably doesn’t happen overnight. Having a system put in place to encourage “matchers” or “givers” would be a good step. It’s applied in all work environment and school team projects. In my experiences, most people, including myself, are “matchers,” in a team. It’s important to get everyone’s commitment at the beginning of the task and work towards the same goal and define everyone’s responsible part of the task. It would be harder for “takers” to continue “taking” as their job responsibility is clearly line out. The managers and bosses should be paying attention to how their employees work and reward or discourage such behavior. I think “takers” are also less likely to be considerate about customer’s need and provide service they want verse “givers” would provide services that is above and beyond. Like every one said above, “Giver” is a desired partner to work with on a team. Based on my experience working in a group, it seems most of time we have “Matcher”. In my personal opinion, to be a “Giver” is not that simple. First, you have to be passionate about what you are doing because passion is the reason why you are willing to give. What’s more, proactive personality is a very important attribute to be a “Giver”. Proactive person is a kind of person who inclines to fix what is perceived to be wrong, change the status quo, and use initiative to solve the problems Instead of waiting to be told what to do, proactive people takes action to initiate meaningful change and remove the obstacles they face along the way. However, sometimes the proactive personality may add pressure to the rest of team. I agree that Claire’s opinion, in the school team projects, our team members have the same goal to achieve our task, we received some knowledge, information and skills from the textbook or our professor’s experiences. After receiving those and we start to combine those knowledge, information or deeply research to do our project. Therefore, we become the matchers to discuss and commit our task. In the work place I think that managers or boss need to have positive attitude and trust their employee or reward, it may let employees have positive attitude for their work. I believe that relationships really play an very important part in an individual’s success in the modern times, especially in the workplace. Helping others means enjoying yourself! 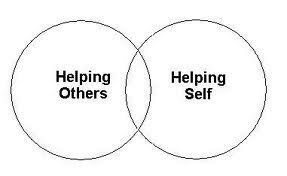 Because when giving others some help, correspondingly, you are helping and improving yourself. Therefore, helping others can bring good feelings to both the giver and receiver of the good deeds to a certain extent, and can also reduce stress and increase happiness in the workplace. It is a great way to help yourself. Certainly, I have to say not very many “Givers” exist in our society. In addition, I agree with that employees’ attitude of working on groups and how they act as either a Taker, Matcher, or a Giver can mainly contribute to the achievement of long-term success in the workplace. It is very important and necessary to have a helpful attitude at work. As we know, attitude is everything. Ultimately, no matter you are a Taker, Matcher, or a Giver, helpful attitude indeed facilitates both individual’s and group’s success in the workplace in the long term. I enjoy being a giver at work, with a caveat: while I don’t expect anything in return, I will be reticent to help if I perceive an attempt to take advantage of this trait. Usually, this isn’t an issue, and most people respect (and rely on) an individual with a good work ethic and an accommodating personality. But as a giver, you must be able to say “no,” and “give” the appropriate perspective to those who intentionally or inadvertently seek to exploit. By doing so, people will be much more positively responsive those times when you must play the matcher or the taker. Being a giver, taker, and maker are all important when it comes to the success of a business and as an employee in a business. I am more of a giver than anything else. I like to help others and I like to make sure that the work that is needed to get done. I have been like this since I was a little girl. As time has gone by I have become more of a maker as well. In order to give, you have to be able to make something of what is given to them and then presented to other and or the company. It is essential to be able to tackle all three, and by doing so there is low chance to fail and or not do what is expected. I agree the the comment above me, by being a giver you must be able to say no to certain things. You must know what is important and what is detrimental to the main project. By saying no you are able to filter out what is not needed, evoking the parts that are not essential will ensure a great outcome. I am a giver type of person. My mother hated selfish people, so I was never allowed to talk about my self, as it was deemed arrogant and distasteful. I don’t mind helping people out, but I find that it is difficult to ask people to help me. Sometimes I feel like a doormat from my over-givingness. I really strive to help assist in the matching, but it is difficult when you are dealing with strong personalities. It really bothers me when certain restaurants and retail chains have associates that clearly hate helping out the public. If you don’t want to help people, don’t get a customer service job. Interesting concept. I always try and be someone who gives when it comes to work but it is definitely a fine line that you have to walk between giving your all to the company and the company taking advantage of you. The important thing is to be a part of an organization that you believe in and that way you can give as much of yourself as possible and never feel you are being taken advantage of. As a student, this article reminded me of all my group projects… when I asked myself this question I couldn’t find an answer because for me it always depends on my team members. For instance, if all my group are working hard and putting a lot of effort in the project consequently i will and ill be a giver. however, if they are expecting that I will do all the work I won’t be a giver and focus on being a taker. In general, I am a giver and matcher because I hate when I fail or do bad in an assignment or a project. Giver is a ideal personality in workplace. I agree this post. the key to success in work place is relationship. I think I have to take time to build good relationship in workplace and class as well.I believe I’m giver because whenever I do something for people i never expect return. Based on the many group projects I have worked on, this article certainly applies to the group dynamic of many of the groups that I’ve worked with. I feel as though in some groups, you do have multiple givers, and unfortunately, multiple takers. In some cases it is fluid and group members change from one trait to the other as the term progresses. Personally, I can be a control freak, specifically if the project is something that I’m passionate about. Their tends to be takers in almost every group and to compensate, I tend to become more of a giver, to ensure the work is done correctly. However, I also tend to enjoy taking on the leader role of group projects, especially if no one else has yet to take the reigns, which then leads to myself acting as the giver. Although, I also don’t want to sound as though the matcher is any less valuable. If all team members were givers, it could counteract positive results. This is a very interesting article. We work with people on a daily basis whether that be in the workplace or in an academic setting. I don’t have much experience in a professional workplace setting but more in an academic setting. In the workplace I have seen myself be in the more helping hand of others. Helping others accomplish their task. If they can’t do it then offering to help them do it so it meets the timeline. I think this has transferred over in the past year especially the last two terms. I have taken a more leading role in my group work. Being the one who leads the group to complete the tasks. If there is a task no one wants to do then taking that task and making sure it gets done. I would have never been able to take these leading roles had I not had the experiences i’ve had in the past year. I believe they will transfer over well into my first professional job. Have seen this first hand in the work world, I agree it applies to every position that includes teams. While short term, some individuals might take in order to cut corners and do less work. I believe in the long-term this will hurt them because co-workers will not want to work with a person who displays such behavior. Takers can also bring down an entire team and make every one else work harder (creating resentment towards them). Always giving could turn into a fault of an employee as well because if they are always focused on others they might not be meeting their own needs or reaching their full potential in the work place. I think a matcher, as visually shown by Venn Diagram accurately depicts a healthy, balanced work relationship between co-workers. Unfortunately, I think we are going to encounter “takers” in a lot of aspects of our lives. I definitely see them in mine and it can be hard to deal with them. I can see myself being a giver in many situations, but at a certain point you have to stop if you consistently aren’t getting a fair amount back in return. Takers need to learn to do their fair share. This is a really interesting article. My current job is caring for elderly in an adult residential care facility. I think that in my opinion, when it comes to my residents I’m a giver because it’s my job. When it comes to dealing with co-workers I find myself more of a matcher. There are always opportunities that come up when I can become that giver in the workplace and when I do take those opportunities it feels much more fulfilling. I can see how the 3 types of people balance each other out, but I agree with the mood of the comments when I say that it appears “takers” are the most toxic to the workplace environment. Matchers I like to think of as the people who see the value in working together, and adapting to the situation to create the most successful environment in the workplace. I think Givers are important as well, and potentially the hardest category to be part of since you receive nothing in return for your hard work. I have found myself to fit very comfortably in the “Matchers” category and have noticed that trend in my workplaces, sometimes what needs to be done needs to be done. Setting your ego aside can increase productivity for everyone.